With the passage of the Companies Act, 2013 the mandate for corporate social responsibility (CSR) has been formally introduced to the dashboard of the Boards of Indian companies. The inclusion of the CSR mandate under the Companies Act, 2013 is an attempt to supplement the government’s efforts of equitably delivering the benefits of growth and to engage the Corporate World with the country’s development agenda. 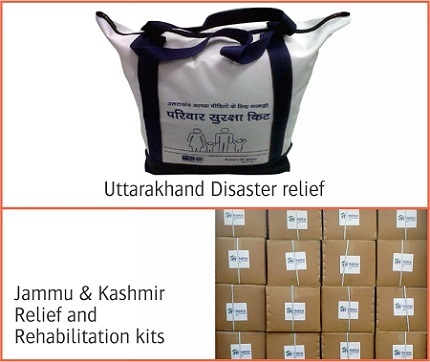 Toyop Relief has vast experience in supply of relief goods to Global NGOs across the world. We would utilize this experience in meeting the demands and need of local community. We truly value the partnership between Toyop Relief and other organisations which aim to improve social, environmental and economic conditions where they operate. It is our intention to create a working environment second to none. We are inspired by a vision to serve a larger national purpose. It is therefore our conscious strategy to design and implement Social Investments / CSR programmes for our valued customers by enriching value chains that encompass the most disadvantaged sections of society, especially those residing in rural India, through economic empowerment based on grass-roots capacity building. We not only supply but partner NGO's in providing complete solutions for humanitarian aid and development. We can develop programs along with product selections in alliance with corporate and NGOs as per their need and requirements In each of the program areas that we will work in developing a detailed strategy that will lay out the context, the opportunities for work, and the outcomes that we will seek to achieve. Once the programs are defined, partners who can work together to deliver those program goals will be identified and supported. We realize, however, that the roll-out of the strategy should be carried out in a phased manner. We set objectives and fulfil our commitments, guaranteeing transparency, respect and safety. We ourselves follow fair trade practices and strictly prohibit child labour and discourage practice of the same and give due consideration for environment concerns. To align and integrate Social Investments / CSR programmes with the business value chains of your Company and make them outcome oriented. To enhance the brand value of the partner corporate and NGO by supplying quality goods required by the recipient. Supply International quality products for the CSR activity to enhance the companies brand image.